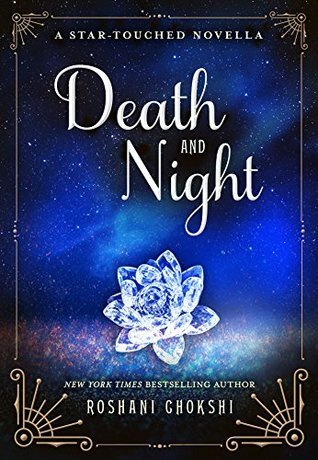 Death and Night by Roshani Chokshi. What property is left to dreamers when every idea has been tamed and conquered? What about the poet who dreams of embracing the night sky? You are courageous and clever, creative and compassionate. But your doubts will ruin you if you let them. Choose happiness. Choose love. There is this pesky holiday coming up that clever advertisers have turned into over-priced roses and cavity-inducing Hallmark card slogans. Not much love lost between that particular date and me. However, I will never say no to a sweet and clever love story. I won’t even attempt to find a fitting description how Roshani Chokshi can craft magic with words and make your heart grow about three sizes if you’re so inclined. Of course, this novella is way too short. I could have read about Death and Night and their courting and wonderful love story for at least a hundred more pages. But wait, I already got to do that in The Star-Touched Queen, which now feels even more bittersweet for all the extra knowledge about how those two main characters really met and fell in love for the first time. This is also so much more than a love story. Just like in the novel these characters function well enough on their own but through each other they start to question the status quo and grow so much. They are not better together but because of each other. I love it when Night discovers that she doesn’t need Death to be influential and powerful. And that Death can well keep himself guarded and aloof but the world is a more magical place if you encounter wonder from time to time. Safe is not the same as free. Wonder and love and wit and banter, the perfect package if you ask me. I’ll take those letters over flowers and cards anytime. My reading tracker just admonished me that I was falling behind on my challenge (which, by the way, is not true, I just can’t log what I’m reading you nosy machinery). Have you challenged yourself to a number of books/pages or anything this year? Share your thoughts and teasers in the comments. Good teasers! Makes it sound easy, "Choose happiness." My Teaser is from an urban fantasy title.